In the roiling debate about what to do with the nation’s health care, it would seem a good idea to find out which practices work and which ones don’t. But that knowledge can be hard to come by. Toward that end, five of Virginia’s major health plans are taking part in a new pilot program led by the Catalyst for Payment Reform (CPR), a nonprofit group that seeks to measure “which strategies are having the desired impact in the market,” according to its website. 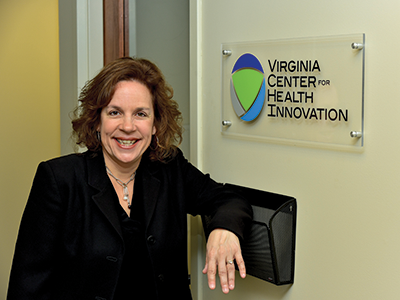 Virginia will be one of three states taking part in the CPR project, says Beth Bortz, president and CEO of the Richmond-based Virginia Center for Health Innovation (VCHI), which is responsible for getting the state’s health plans involved. New Jersey is the second state, and a third is so far unnamed. The VCHI and the Virginia Association of Health Plans are co-sponsoring the effort here. The health plans participating in the project are Aetna, Anthem, Optima, UnitedHealthcare and Virginia Premier. Each has agreed to provide data to CPR about health-care spending during a one-year period, reaching back through 2016 or the most recent 12 months. Not all the state’s major health plans are participating. CareFirst in Northern Virginia and Cigna, which operates statewide, might participate but haven’t yet agreed to do so. Funding for CPR’s work comes largely from the Robert Wood Johnson Foundation and the Laura and John Arnold Foundation. Results are expected by next August. And secondly, Bortz says, pretty much every part of health-care policy will be, or should be, backed by data. “All of that is going to require more sophisticated data, more actionable data, more timely data than we have had in the past,” she says. Involvement with CPR will help a project VHCI has already begun. It is a data-based measurement of health care called the Virginia Health Value Dashboard. Its purpose “is to prompt action for improving the value of health-care services,” says VHCI. Examples of “low-value” care that the dashboard project is targeting include: avoidable emergency-room visits, hospital readmissions and the use of high-cost service sites when less expensive options are available. The “high-value” care examples include: up-to-date vaccinations, smoking cessation programs, better screening for cancer and improved management of chronic conditions such as diabetes. The goal is to have in place by January a dashboard tool for groups that provide, buy or fund health-care services to use in evaluating various costs. Being part of the CPR’s project is a big step toward that goal. “It costs money to get good data,” Bortz says. Good information is being collected about health-care spending, but it’s generally held by private entities like hospital groups or commercial health plans, and they don’t share that information. “The challenge is: They’re all going in different directions” serving their own competitive interests, Bortz says. Bortz notes that Virginia ranks high among the 50 states for its “business-friendly” environment and per-capita income, but its rankings fall to the middle of the pack or lower on national health scorecards. 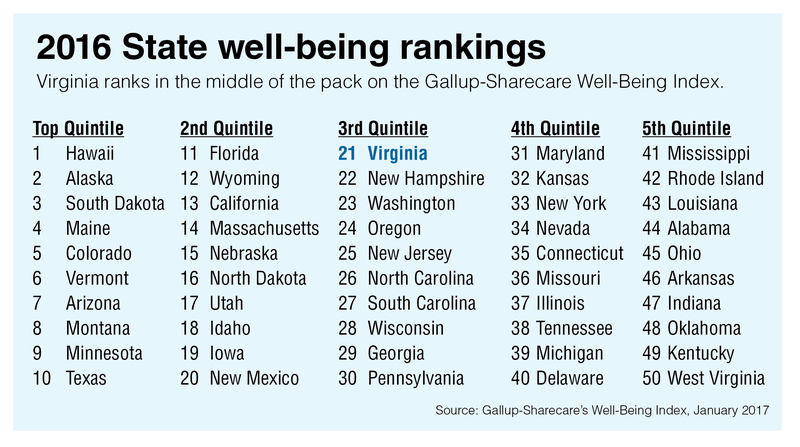 For example, Virginia is 21st in the nation on Gallup-Share­care’s Well-Being Index and is ranked 42nd by Mental Health America, a nonprofit group based in Alexandria. 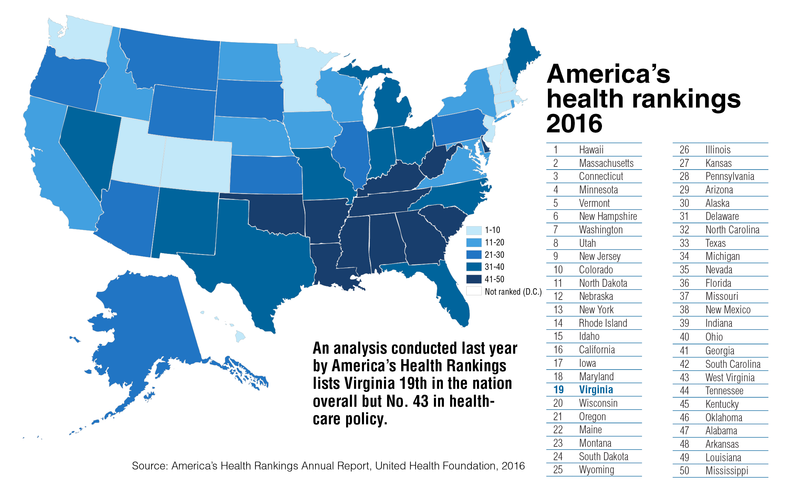 A 2016 state-by-state analysis conducted by America’s Health Rankings, which examines a wide range of health issues, ranks Virginia 19th in the nation overall but 43rd in health-care policy. The willingness of the state’s health plans to share data was a key factor in Virginia being invited to the CPR project. Without their help, the project won’t happen. The data that health plans share with CPR will be measured in aggregate so that no secrets will be spilled. “This is to be used by Virginia for its strategic purposes,” she says. In fact CPR would like to do similar studies in every state, or at least see some entity, private or public, do the studies. In a best-case scenario, the report can be done every year. The results of this year’s analysis “will be a snapshot” of what’s going on in Virginia’s market, Caballero says. The goal isn’t to compare Virginia’s health-care spending with New Jersey or any other state, “but the more states we have information on, the more we can determine what are the market impacts of health-care spending decisions,” she says.